What happens in the dark forest while you sleep? Ten days ago, I was up at Sky School with a group of middle schoolers, and walking past the enlisted barracks in the night, we saw a light on in a downstairs window! I don’t know if some electrical system went haywire, someone had broken in, or the ghosts were out in full force in anticipation of the full moon (this was two days before the lunar eclipse). One week later, I passed by in the dark, and the light was off. Spooky. 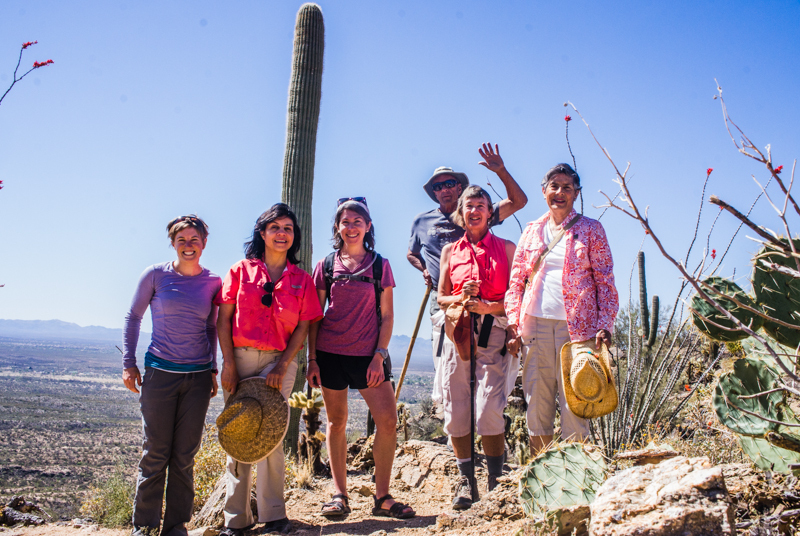 This morning, I took a hike on the Tanque Verde trail with four other alumnae of Scripps College out at Saguaro National Park East, in the Rincon Mountains. As usual with Scrippsies, we had a beautiful location, great conversation, and of course plenty of fantastic food. Some ocotillos have lost their leaves (these are red), but all of them are blooming. Nice view up on the ridge. But while we ate, I noticed the vicious killer I posted video of just this week stalking around the outskirts of our ramada: Harris’s antelope squirrel (Ammospermophilus harrisii). 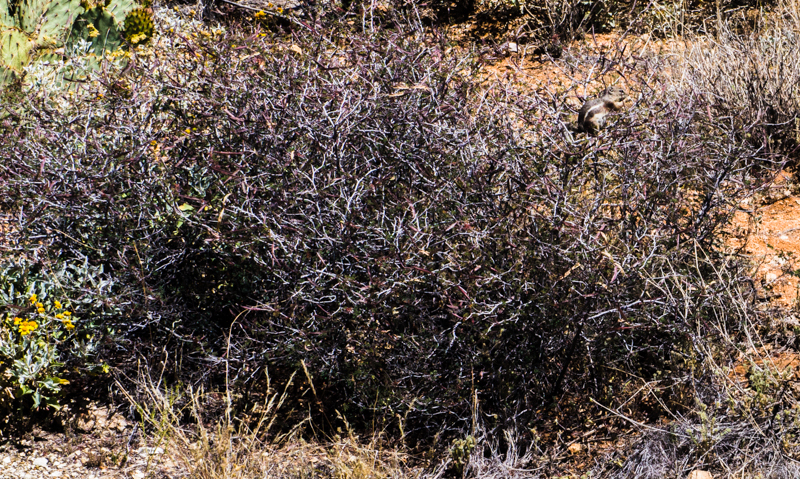 Today she (or he) was far more interested in perching several feet above the ground (so much for being a ground squirrel) to nibble on the seed pods of the shrubby leguminous fairyduster (Calliandra eriophylla). I have no doubt that as soon as we left, our crumbs supplemented the fairyduster appetizers. It occurs to me that paloverde and mesquite seeds and seed pods are also edible to humans – does anyone know if fairyduster seeds are? A quick Google search turned up reports of other members of the Calliandra genus having toxic seeds, but I don’t know about this one. 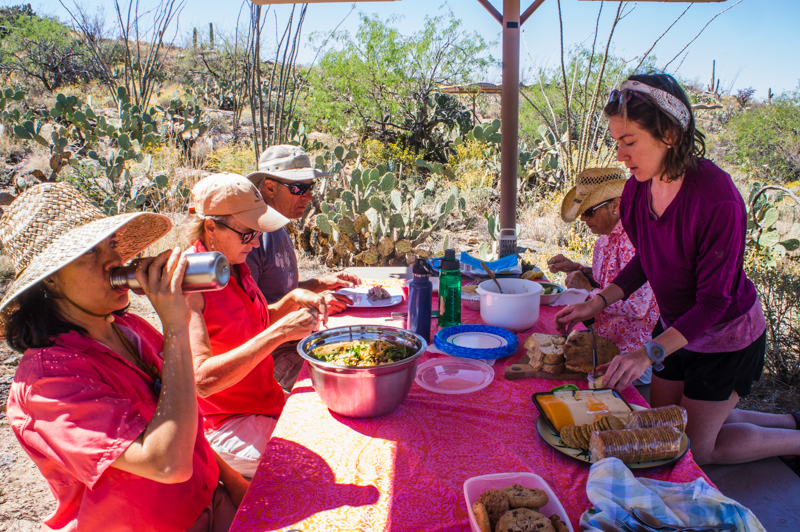 Visitors to southern Arizona sometimes compare the landscape to Africa, with saguaros substituted for elephants. It may not surprise them to learn that some of the grass in the foreground of this photo was actually introduced from Africa. 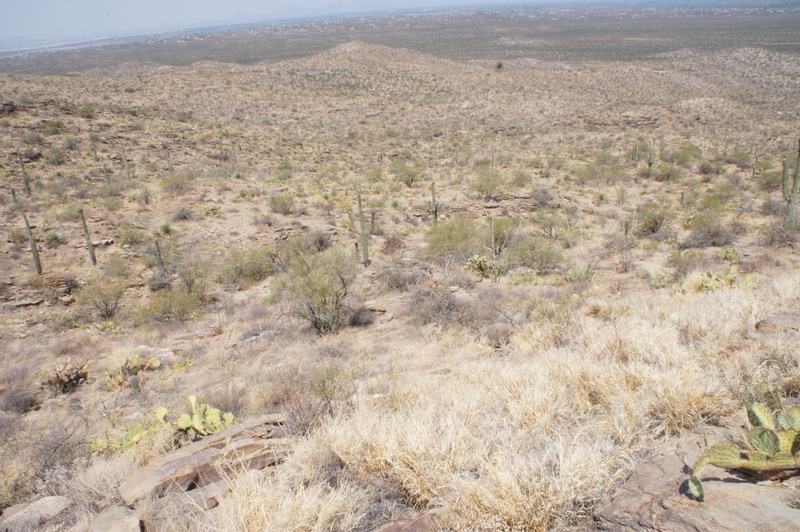 Celeste Patterson, a field assistant last summer, has been analyzing videos from motion-detecting cameras in Saguaro National Park East we took last September to determine differences in animal richness between mountain ranges and whether it is affected by grass invasions. She pointed out these videos yesterday. We have tentatively identified the hunter as Harris’s antelope squirrel (Ammospermophilus harrisii), and the insect larva has not been identified. 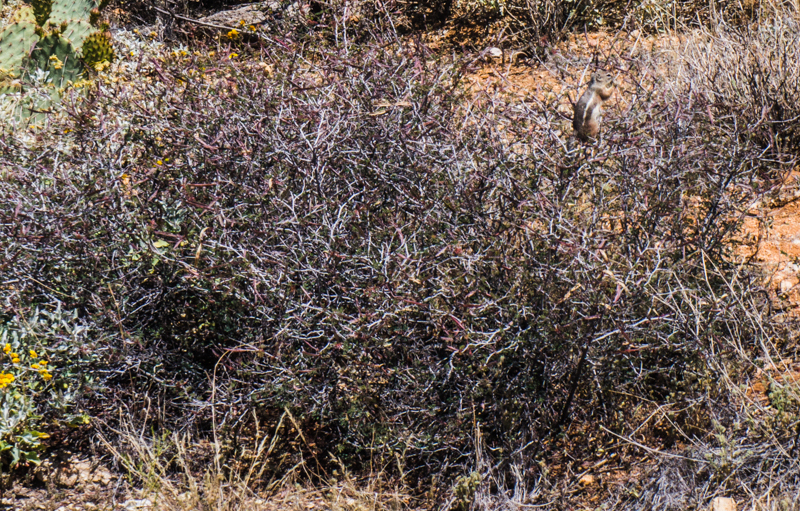 These antelope squirrels were noisy and prominent during the monsoon season, chirping continuously from exposed, rocky outcroppings. We have plenty of videos of them eating the sterilized millet seeds with which we baited cameras, and I was interested to read in Hoffmeister’s Mammals of Arizona text that although they eat primarily fruit and vegetation, with plenty of insects and meat when they can steal it from baited traps, one was even recorded to have killed and partially eaten a pocket mouse (one of the dancing kind) when they were left in a cage together! 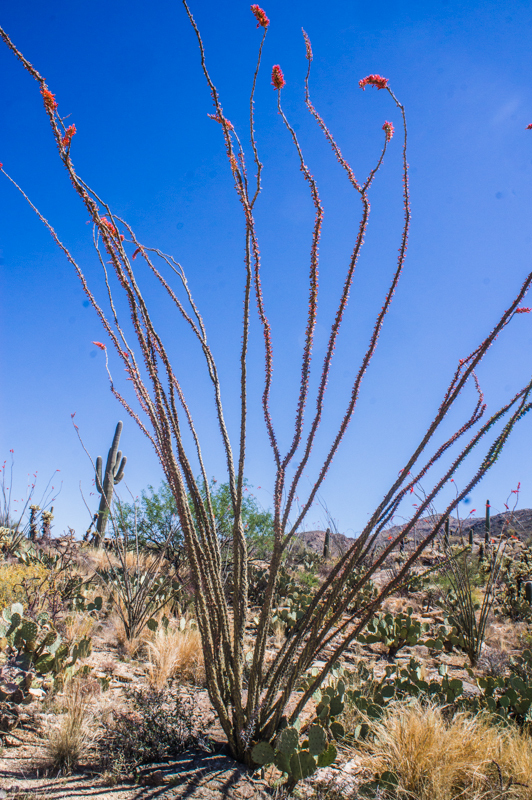 To learn more about the differences in animals between Saguaro National Park East (Rincon Mountains) and West (Tucson Mountains), check out Celeste’s poster at the EEB Undergraduate Poster Session from 1-3pm on April 16, on the north side of BioSciences West.